Bohemian painter, printmaker and teacher. Until he was 18 he was trained by his father, Wenzel Fhrich, a painter and mason. In 1819, at the academy exhibition in Prague, he made his dbut with two history paintings. Their success enabled him to study in Prague. Drer was the first powerful influence on his style; on a visit to Vienna in 1822, medieval and Renaissance art made a similar impression. His illustrations for Ludwig Tiecks Leben und Tod der heiligen Genoveva (1824-05) attracted the interest of Prince Metternich, who helped him obtain a scholarship to study in Italy. On his arrival in Rome in 1827, Fhrich made contact with Friedrich Overbeck and other German artists there. He met Joseph Anton Koch and was commissioned to complete the Tasso room (1827-09) in the Casino Massimo. In Rome he was impressed by Italian Renaissance works, particularly Raphaels frescoes in the Vatican. On the return journey to Vienna, he admired Fra Angelico s paintings and the frescoes in the Camposanto in Pisa. After a period in Prague, Fhrich obtained a teaching post in Vienna in 1834, becoming professor of historical composition at the Kunstschule in 1840. 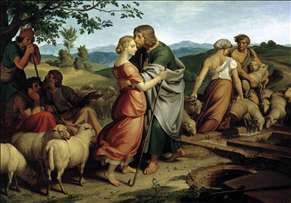 Such works as Jacob and Rachel at the Well (1836; Vienna, Belvedere) and the Legend of St Isidore (1839; Mannheim, Kunsthalle) made him the leading representative of Nazarene-style painting in Austria. In 1844-6 he produced a monumental cycle of the Stations of the Cross for the church of Johann-Nepomuk and in 1850 completed the cartoons for the frescoes in the Altlerchen Church, Vienna. His late work consists largely of prints and drawings with a religious content, which brought him great popularity. See more details about "Jacob Encountering Rachel with her Father's Herds"